0.2 MUST HAVE VPN APP FOR ANDROID WE WILL GIVE YOU ARE ALL FREE BUT YOU CAN STILL UPGRADE IT IF YOU WANT. 0.3 1. Hotspot Shield Free VPN. 0.4 2. VPN Master-Free Unblock Proxy. 1 3. SuperVPN Free VPN Client. 1.1 4. Betternet Free VPN Proxy. Android VPN apps help us surf the web protected from Malicious Site. VPN Apps helps us surf the net with privacy and full encryption of our data. Vpn Proxy servers also help us access restricted sites and portals, this is one of the best need of VPN proxy server. If your school or Country or Location is restricted to some Site and Location, Vpn proxy server will help you tune your phone to match the Location you were restricted to and doing so, the VPN app will help you surf the web Anonymously. In our List, We will be giving you the list of Some of them that you must have on your Android phone to make Browsing the web easier and Fast Accessible. MUST HAVE VPN APP FOR ANDROID WE WILL GIVE YOU ARE ALL FREE BUT YOU CAN STILL UPGRADE IT IF YOU WANT. 1. Hotspot Shield Free VPN. Due to the fact that am using the PC version of Hotspot Shield and it gives me everything I want without even thinking of using any other VPN Software on my PC. When my PC is away with me, my Next option is Hotspot Shield VPN. It gives the chance of Securing our Data is a lightweight Operation. Hotspot Shield doesn’t consume space on our Android phone. Hotspot Shield also has A Google Chrome and Firefox Browser extension and A PC Software. It is an app from AnchorFree GmbH. 2. VPN Master-Free Unblock Proxy. VPN Master seems to be a new VPN app with 200,000 downloads on Google Play Store. The interface looks little Familiar with Hotspot Shield. VPN Master requires No Username or Password for you to use it. It is an Instant Activation Software. It also has the option to select your desired Country of Location or the country you desired to visit. It is an App from VPN Master. 3. SuperVPN Free VPN Client. This is an App with 400,000 downloads on Google Play Store and a 4.2 Total Rating. SuperVPN is an app without an in-App Purchase which means is totally free and doesn’t need an upgrade. It doesn’t Require any Root access to work, No Registration, Username or Password to use it, Just Launch and connect. The only CONS of SuperVPN is that it provides 20days trial and after that days, you have to use 180minutes per session and Reconnect and start again. Requires: Android 4.0.3 and Up. The size of App: 5mb. 4. Betternet Free VPN Proxy. Betternet is a Free VPN Proxy App with 300,000 on Google PlayStore and an Average Rating of 4.4. It is an In-App Purchase App which means that there is also a Premium version of it. Betternet helps Access country Blocked Websites and Secures your browser as a Shield. Betternet also helps to secure our Wifi network from Hackers Attacks and threats. Betternet also have a have a PC Software and Google Chrome Browser Extension. It also has an iPhone App, available on iTunes. SurfEasy Secure VPN is an app with 150,000 and an Average Rating of 4.5 User Ratings. SurfEasy Vpn is a part of the Opera Software and helps bring full anonymity to our Internet World. It VPN Service includes Wifi Hotspot Security. It is a Free App with a Premium Version. You can Upgrade your Free Version To Premium to enjoy some Features like AdBlocking and Faster Access. 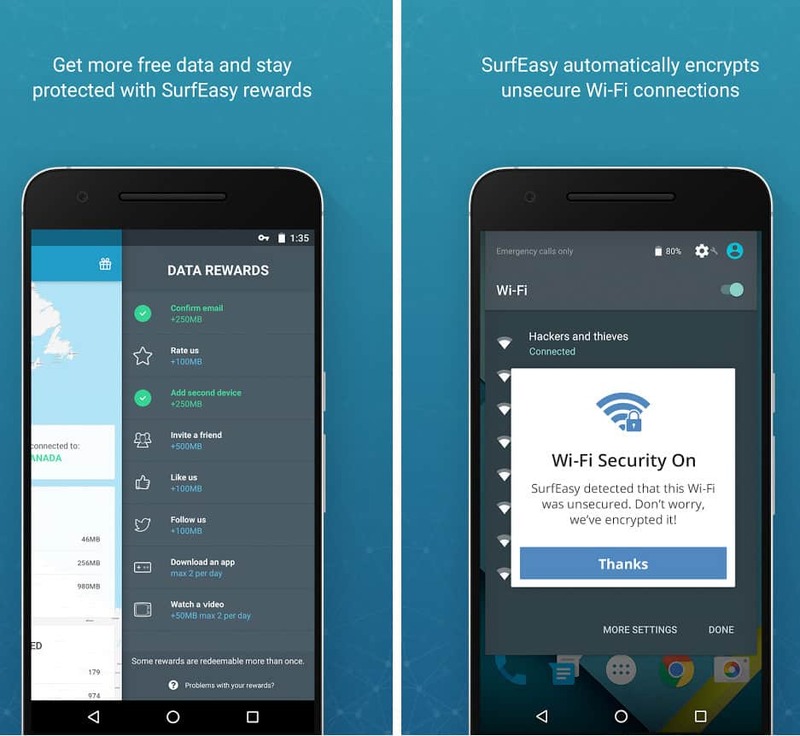 It is an app from SurfEasy Inc.
SurfEasy VPN Proxy also have a Google Chrome Browser Extension, A Windows PC Software, and a Mac Software. One Thing I love about Phison VPN is that it can Hack Your service Provide Network Restriction. It is been used by Many people in my location and it is the highest used VPN there. Phison Vpn requires a little Setup for you to Bypass your Network Service Providers Restrictions. You can get the information you need by Googling it. Phison VPN also has the feature of Auto best Speed experience which means it scans through Proxies and chooses the Fastest Proxy Server. You can also choose your Preferred Country Location Manually. It is a lightweight app that doesn’t consume our phone’s memory. There is A Windows PC Version of Phison VPN. It has 5-600,000 downloads and 4.2 Total Average User Ratings on Google Play Store. Requires: Android 2.3 and Up. This is a Collection of our MUST HAVE VPN APP FOR ANDROID.